The Traffic Bylaw regulates the placement of signs on roadways, light standards and other public areas that have vehicle or pedestrian traffic. 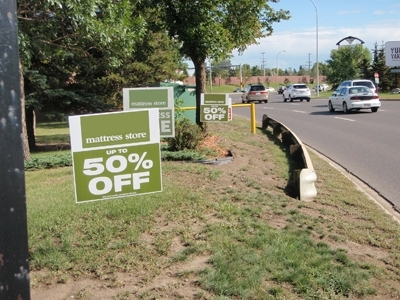 Placing a sign illegally on City of Edmonton property is a bylaw offence with a fine of $250. Review the Traffic Bylaw for more information. The Sign Rules and Regulations for placement of signs on City property are easy to follow.